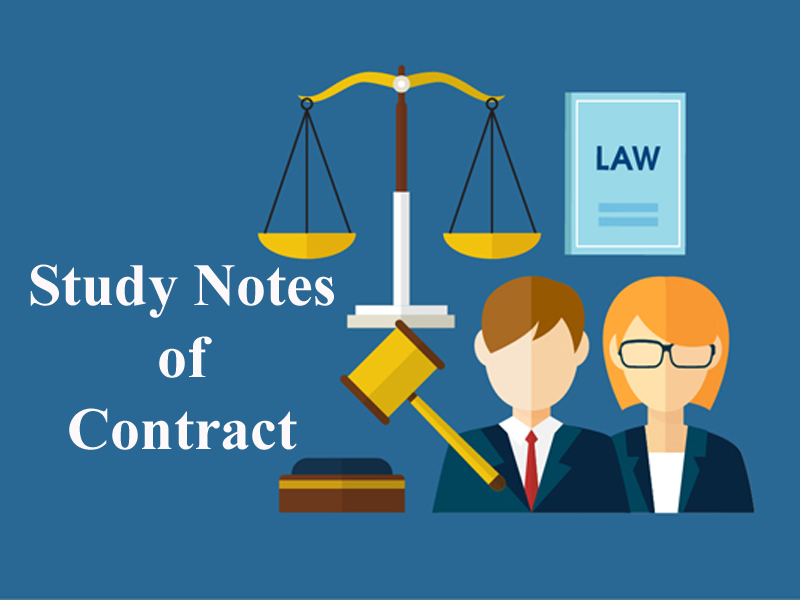 Here we are providing you updated and most relevant Study notes on Contract of Quasi Contracts for Law Entrance Exam. These study notes are highly recommendable for all those who aspire to crack CLAT, DULLB, AILET and other Law Entrance Exam. 1) The term “Quasi” means similarity or “bears resemblance to”. 2) Quasi Contract is similar to contracts, in respect of the contractual obligation. However, it is different from a contract, in the respect that there is no formal agreement entered into by the parties. 3) In case of quasi-contracts, there is no offer, no acceptance, no consensus-ad-idem and absolutely no intention on the part of the parties to strike a contract. Still, the law, from the conduct and relationship of the parties, imposes an obligation on one party and confers rights on the other party. This obligation is called quasi-contractual obligation. 4) Thus, quasi-contract is based on the doctrine of unjust enrichment, which declares that a person should not be allowed to enrich himself unjustly at the expense of another. 1) Claim for necessaries supplied to a person incapable of contracting or on his account. Anand supplies necessities to Yamini, a mentally unsound person, which are suitable to her condition. Anand is entitled to be reimbursed from Yamini’s property. a) The minor or the person incapable of contracting is not personally liable. b) Only property is liable. c) The goods supplied or services rendered must qualify as necessaries. d) The only reasonable amount can be claimed for the supply of necessaries. e) Such necessaries should be supplied only to person incapable of contracting or his dependents. The Contract Act lays down that if one person who is interested in the payment of money which another is bound to pay by law, and the former pays it, he is entitled to be reimbursed by the latter. Example: A sub-tenant pays the arrears of rent due by the tenant to the landlord, in order to save the tenancy from forfeiture. When a person does something lawfully to another or delivers something to him, not intending to do so gratuitously, the other person enjoys the benefits thereof, he is bound to compensate the latter for the thing done or delivered. Example: SM & Sons delivers a basket containing any fruits to Mr Kishore, by mistake. Mr Kishore and his family consume it, despite knowing that the goods are not intended for them. Now, the family must compensate SM & sons. When a person comes across things belonging to another and takes them into his custody, he must restore it to the true owner. Example: A finds a purse left behind by a passenger on a bus. If he takes custody of it, he is under an obligation to restore it to its owner. Example: A and B jointly owe Rs 5000/- to C, A alone pay the amount to C, and B, not knowing this fact, pay Rs 5000/- over again to C. C is bound to repay the amount to B. 5. A delivery from Amazon has been wrongly sent to Raju. Raju in spite of knowing that he is not the true owner of the goods uses them. Is Raju liable to compensate? 8. Supply of necessities has been dealt with under which Sec. of The Indian Contract Act? 11. The responsibility of finder of goods falls under which Sec of The Indian Contract Act? 15. A leaves goods at B’s house by mistake. B starts using them as his own. Is B bound to pay A for them? Get the updated and most relevant study notes on Contract of Quasi Contracts for upcoming CLAT and other Law Entrance Examination.